1 COMBINE salmon with 1/2 cup (125 mL) Hellmann's® Real Mayonnaise, panko, cilantro, onion, ginger and salt in large bowl. Season, if desired, with ground black pepper. Shape into 6 patties, about 1/2-in. (1.5 cm) thick. 2 HEAT large skillet over medium-high heat. Add oil, then salmon patties. Cook 8 to 10 minutes, turning once, until patties are golden brown and cooked through. 3 TRANSFER to platter and tent with foil. Let stand 5 minutes. 4 MASH avocado in medium bowl. Stir in remaining 1/2 cup (125 mL) Hellmann’s® mayonnaise, lime juice and hot sauce until no white streaks remain. 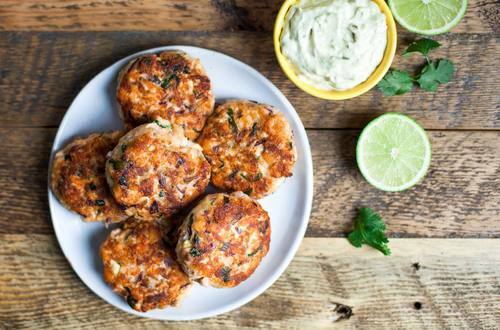 Serve with salmon cakes.